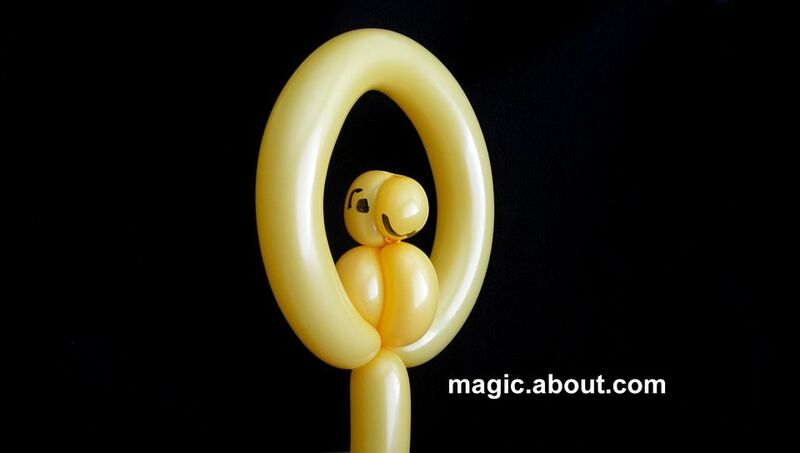 Here’s a fun parrot balloon animal that even comes with his own perch. With this process, you can make lots of them in a short period of time: it only takes a single balloon and only takes a few twists. If you’ve got a lot of kids waiting in a line, this one is as fast as making a dog and one of the faster single balloon animals to make. This one is also cute and has a lot of character, particularly if you use a marker to add details such as eyes and define the beak. One more plus, this one comes with its own built-in handle so it’s easy for kids to carry around. It’s like holding a giant lollipop. This balloon animal applies the basic twists in new ways. Here’s what you’ll need to make the parrot balloon animal. One 260 Balloon - your choice of color but I think that red, yellow or blue look best. The ability to make a basic dog balloon animal. To begin, inflate the balloon to about one and a half inches from the end. Twist one small basic balloon twist about half an inch in length. This will form the parrot’s beak. Twist a second basic twist about an inch-and-half in length. This will form the parrot’s head. Bring the first, smaller twist against the second, larger twist - essentially folding one twist against the other. Take the nozzle and pull and then tie it into the end of the second twist. You should end up with a sculpture that resembles a parrot’s head with a beak. This image shows the finished head of the parrot balloon animal. See how one balloon segment forms the head and the second the beak. Later, we'll use a marker to add details to give the parrot a bit of personality. You might think that one would make the body out of a three-balloon push through and for many bird sculptures, this is the case (as in the balloon “love birds”). You’ll still be making something that is essentially a three-balloon push through, but you’ll be manipulating the balloon in a clever and different manner. At this point, you’ll probably have some slack at the end of the balloon. Compress the body of the balloon to distribute the air evenly throughout the remaining portion of the balloon. What you’re doing is filling out the balloon to remove its “slack.” While it may not make sense now, this will make the latter steps far easier to execute. While holding the “head” of the parrot, grab the end of the balloon and twist it around the parrot's head, leaving about a foot of remaining balloon at the end. You’ll see that you formed a loop which makes up the parrot’s “perch." This image shows the state of your balloon before you make the body. Now, hold the stick (remaining balloon outside of the loop) against the loop and compress a portion of the loop, about three inches, and twist the three portions together. This is hard to explain in writing but it’s quite clear in the video. You’ll have three balloon segments twisted together. Choose one segment and push it between and through the other two. After you make the bird’s body, adjust it so it seats nicely on its perch. If you like, use a marker to add details such as eyes and on the beak. If you’d like to make more bird balloon animals, which include swans, love birds, hummingbirds and more, we have an entire collection of step-by-step instructions.